Large river-floodplain systems are hotspots of biodiversity and ecosystem services but are also used for multiple human activities, making them one of the most threatened ecosystems worldwide. There is wide evidence that reconnecting river channels with their floodplains is an effective measure to increase their multi-functionality, i.e., ecological integrity, habitats for multiple species and the multiple functions and services of river-floodplain systems, although, the selection of promising sites for restoration projects can be a demanding task. In the case of the Danube River in Europe, planning and implementation of restoration projects is substantially hampered by the complexity and heterogeneity of the environmental problems, lack of data and strong differences in socio-economic conditions as well as inconsistencies in legislation related to river management. We take a quantitative approach based on best-available data to assess biodiversity using selected species and three ecosystem services (flood regulation, crop pollination, and recreation), focused on the navigable main stem of the Danube River and its floodplains. 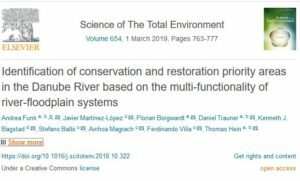 We spatially prioritize river-floodplain segments for conservation and restoration based on (1) multi-functionality related to biodiversity and ecosystem services, (2) availability of remaining semi-natural areas and (3) reversibility as it relates to multiple human activities (e.g. flood protection, hydropower and navigation). Our approach can thus serve as a strategic planning tool for the Danube and provide a method for similar analyses in other large river-floodplain systems.